Frozen Dead Guy Days (FDGD) is Nederland’s claim to fame, reaching almost cult-like status in recent years. Since 2002, Nederland has hosted the festival the second weekend in March. Frozen Dead Guy Days honors the memory of Grandpa Bredo Morstoel. Morstoel died in 1989 and was cryogenically frozen, then sent to Nederland in 1993 to be stored in a Tuff Shed. A caretaker continues to care for him each month, packing him with dry ice. Initially the town resisted having Morstoel’s frozen body stored, but later relented and decided to celebrate by hosting a winter festival commemorating his frozen state. Thus, Frozen Dead Guy Days became a reality. Today, Frozen Dead Guy Days hosts all sorts of whacky events over the course of two days, drawing up to 20,000 people per day. Events include Frozen Turkey Bowling, the Blue Ball, the Parade of Hearses, and the ever popular Coffin Racing. 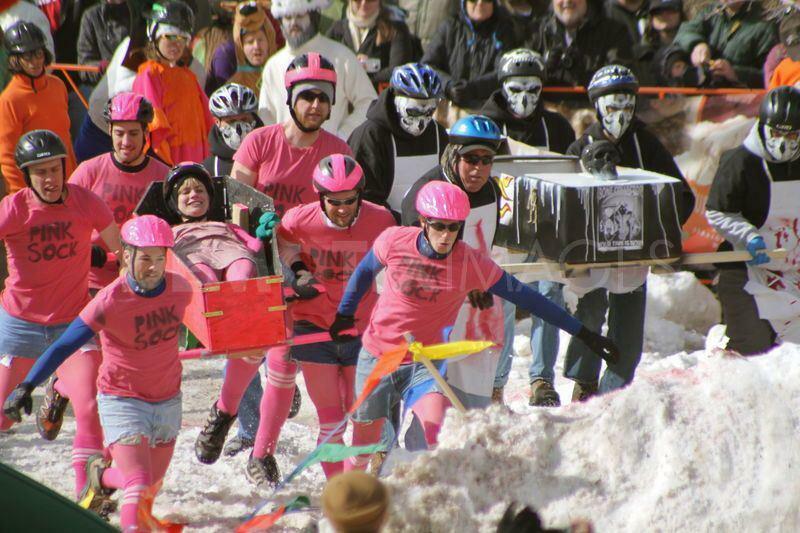 Costumed teams of six people carry a person in an open coffin around a snowy obstacle course. Think people dressed as Kermit the Frog and other muppets slipping and sliding around in the snow, all in the spirit of good fun. While I enjoyed watching the coffin races and other assorted events our first year, these days I steer clear. Literally, there is no parking anywhere, and thousands of drunken people stumbling around. I find it a good time to just hunker down at home with a good book. Despite my avoidance, I support the notion of the festival. Frozen Dead Guy Days brings a much needed boost to the town during one of its slowest months. Thanks Grandpa Bredo, for helping our town out!